The aerial part of Eupatorium fortunei Turcz. of family Compositae. Jiangsu, Zhejiang, Hebei provinces, etc. in China. Dry, a lot of leave, green color, tender with strong fragrant. Dried in shade or sun, unprocessed or use the fresh one. Pungent, neutral; spleen, stomach and lung meridians entered. It is fragrant and usually combined with Guang Huo Xiang for the syndrome of damp obstruction of middle energizer because they are similar in the actions of resolving dampness and harmonizing middle energizer. It also can be combined with Cang Zhu, Hou Po and Kou Ren. It is mild, not warm, and not dry in property and good at curing damp-heat in spleen meridian manifested as sweetness and greasiness in mouth, plenty of saliva and halitosis; it can be decocted alone or with the heat-clearing and damp-resolving herbs such as Huang Qin and Yi Yi Ren. 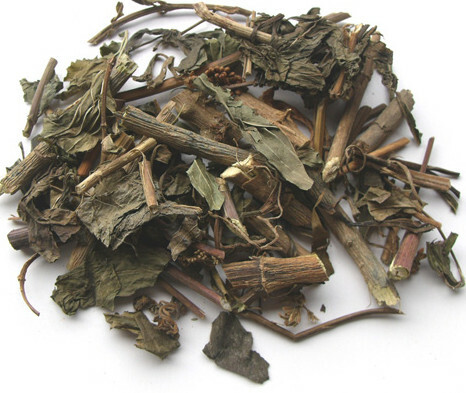 It is aromatic and its actions are similar to Guang Huo Xiang. It can dispel summer-heat from exterior and resolve damp-turbidity from interior, but its actions of warming and dispersing are mild because it is neutral in property. 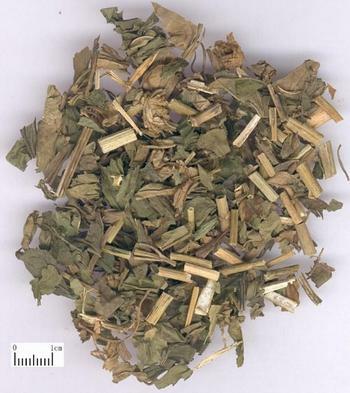 For the early stage of summer-damp syndrome and damp-warm syndrome manifested as chills with fever, headache, chest fullness, and greasy tongue coating, it is usually combined with the herbs for resolving dampness, clearing summer and releasing exterior such as Guang Huo Xiang, Hou Po, He Ye and Bo He.